Awesome deal! 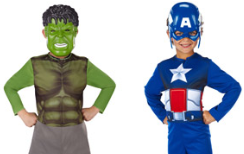 Hurry over to Walmart.com to score the 2 Marvel Avengers Kids Costume Sets – $5 (Captain America and Hulk or Iron Man and Hulk) + FREE Shipping to store. These won’t last long, so hurry!